As Greece continues through its financial crisis, Greeks, both local and from abroad, have found innovative and creative ways to do their part to help their beloved country, and Katerina Soldatou has found her own unique way to do so. In recognition of the country’s reliance on tourism, the aerial dancer has made it her mission to draw attention to Greece’s iconic landmarks, both natural and man-made, by dangling from dizzying heights. 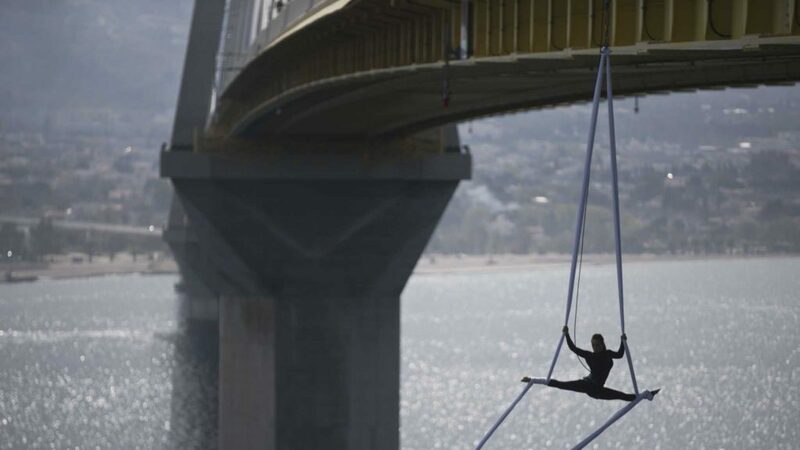 As part of her project Greece Has Soul, her latest performance took place on Monday when Soldatou was photographed suspended by large sheets of white fabric from the Rio-Antirrio Bridge (officially the Charilaos Trikoupis Bridge). At 2.2 kilometers, the multi-span cable-stayed bridge is one of Greece’s and the world’s largest, constructed above the waters of the Gulf of Patras. The gravity-defying performance is one of many Soldatou has given from landmarks across the country, including the Vikos Gorge, Corinth Canal and Meteora. “The idea of the project is to create environmental awareness in Greece and abroad and stimulate interest in Greek history,” reads the official Greece Has Soul website. Soldatou is also the founder and director of Greece’s first ever aerial dance school, Aerial Ever After.